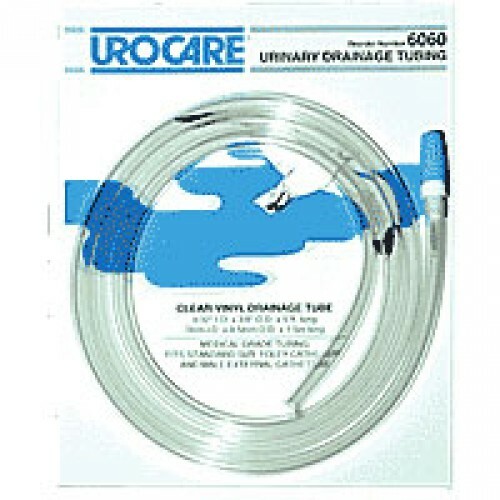 Urocare Clear Vinyl Drainage Tubing - drainage and extension tubing is used to connect male external or Foley indwelling catheters to bedside urinary drainage bags, night drain bottles or other urinary appliances. This Urinary Drain Tube or Extension Tube provides a snug fit on most standard sized connectors, adaptors and fittings while resisting kinks. This Urocare Tube includes cap. May be cut to desired length. This item is something many of our customers pay for even though it is not usually covered by their insurance. I don't know why, but most leg bags don't come with tubing, even though night bags do, and insurance won't pay for tubing separately. We will give rubber latex tubing to our customers at no additional charge, but many of them prefer to pay for this. It is very study, and I haven't heard any complaints about the inside diameter being too small as the other reviewer mentioned. Been using Rusch Belly Bags for several years. Could not recomend any other daytime bag. Legs bags are the pits. 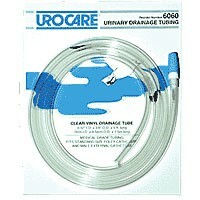 UROCARE #6060 --- It appears to be very sturdy with plenty of length to cut to desired size. BUT-- the inside diameter of the end that fits on the male end of a Bard Urinary Bag is too small. I did manage to make it fit by slightlly increasing inside diameter with two spoon handles and applying silicome lubercant. That wore this 80 year old to a nub.